Hi up for sale is My 2001 Mitsubishi Evolution 7. Car only arrived (imported) Into Australia and got complied and registered on Friday 15-06-12 making me the 1st Australian owner . Car is black in colour which is rare in evo 7. Car is in great condition inside and outside. Have just put new 6 months rego on the car as of the 12-12-12. Interior is in great condition no scratches or rips on the seats a few stains on the front seats from overseas. Car was checked over by a mechanic an is in excellent driving condition drives very smooths, Gearbox Drive train and engine a perfect. Car has a brand new OEM Clutch that was just done by Envy Dyno who imported the car. Recently put a new front bar on the car with Carbon Fiber Front Lip looks great! Car came with some aftermarket accessorizes listed below: Full 3 inch exhaust System Silicone intake pipe Aluminum Radiator Cusco front and rear struct Bars ARC Aluminum turbo heat shield Greddy adjustable BOV Car just had the standard computer Ralliart Tuned/Flashed Goes very well.. Yokohama Semi slick tyres all around Car has had a service including radiator flush an new coolant, new spark plugs and also new brakes all this was done 3500klms ago. Just had Air-con regassed 2 weeks ago. Car does have some small scratches here an there an also a dent in the rear passanger side door and scratches on the rear bar. Car has never been in any accidents an is not on REVS or PPSR an no money owning.. Any Checks Inspections welcome.. Car has 129000 Klms on it. Located In Sydney. Asking $17900 ono Or swaps of interest Any enquires or questions please message me on 0434 289 086. For sale is my 1998 Nissan Skyline R33 GTS-T Series 2 40TH Anniversary Edition.5 speed manual turbo. 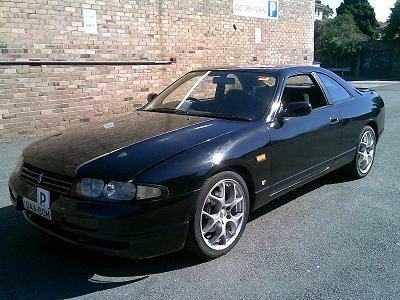 Original 40th anniversary edition is the last ever of the r33 shape and is built 02/98. Very low original 124,000kms with full japenese log books and a huge bunch of receipts. I just recently serviced the car and installed Bendix brakes and machined the discs. it has a few modifications which include: - Brand new X FORCE exhaust system from turbo back costing me $1400 only 6 weeks old. - PCG jdm Blow Off Valve. - APEXI N1 coilover suspension all around. - Aftermarket strut brace. - NISMO boost / water guage mounted in side pillar. - Brand new BLITZ panel filter. - Brand new turbosmart boost tap. The car was only imported 4.5 years ago. It is very straight and has never been in a collision. Has a few light scratches which is expected on a black car but nothing major. Always run on BP98 premium fuel. Constantly washed and serviced on time. The car has rego up until the 24/9/2013.I am negotiable on price just call me or text me on 0435 192 788. Located in sydney. Located in Lakemba at the moment... Yeah the old cluster wasnt working so i had put in a new one. As far as i no the old cluster did have 130000klms on it sorry forgot to mention it in the add.